If you are a fan of a little "something extra" when it comes to your online gambling experience, let the God of Wealth smile down upon you with two unique ways to earn yourself some free spins. The God of Wealth slot machine from RealTime Gaming is a highly anticipated Asian-themed slot with plenty of unique ways to win. Players at Sloto Cash Casino have access to two separate promo codes that can help them earn even more as they spin their way to big wins. This title comes beautifully designed with cartoonish, yet realistic graphics that are as pleasing to the eyes as they are to your wallet. The game offers five reels and 25 paylines filled with a variety of oriental images, including Choy Sun Doa, who is the ancient Chinese "God of Wealth". Fittingly enough, he acts as the wild symbol in this title and offers up more opportunities to win. The top jackpot is 10,000 times the line bet, which can come to quite a sum of money for those who choose the maximum per-spin bet. There are free spins, bonus rounds, and much more to see and do as you enjoy the God of Wealth slot machine. RealTime Gaming (commonly known as RTG) is a Canadian favorite in the online casino world. They produce hundreds of unique and interesting online slots as well as other casino classics such as baccarat, roulette, blackjack, and more. The company regularly releases brand new slots like this one in order to drive interest in their products and to keep dedicated players coming back for more. Finally, RTG offers up instant-play in-browser software as well as completely downloadable suites for their patrons. 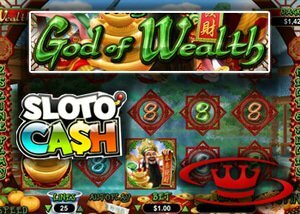 In order to welcome the arrival of the God of Wealth slot machine to Sloto Cash Casino, the venue is making two unique promotion codes available to all of its new and existing patrons through February 10, 2016: •	Promotion 1 - GODOFWEALTH: Players who enter this code at the cashier screen will receive not only a 111% match of their deposits, but also 20 free spins on the God of Wealth slot machine. With luck, these players will land three of the Gold Ingots and gain access to even more free spins with multiplied wins. •	Promotion 2 - WEALTH: With this promo code, players can get a 50% deposit match worth up to $100 and 25 free spins on the God of Wealth slot machine. These promotions allow Sloto Cash Casino patrons to enjoy the wonderful title with a little something extra, giving them an even better opportunity to win! These bonus offers are only available through February 10, so those who want to take advantage should enter the codes as soon as possible. Free spins provided by either of these promo codes are only valid on the God of Wealth slot machine and are subject to 10x playthrough requirements. Sloto Cash Casino's standard wagering requirements apply to the deposit bonuses, as well. The God of Wealth is poised and ready to provide everyone with free spins and big wins. It's a brand new game with outstanding graphics and lots of smiles, and it only in RealTime Gaming casinos like Sloto Cash.